A pair of tufted puffins is nesting on Elephant Rock off Bandon for the first time since 2001. "Local puffin watchers are really excited to see these birds return," said Dave Ledig, South Coast refuge manager for the U.S. Fish and Wildlife Service. 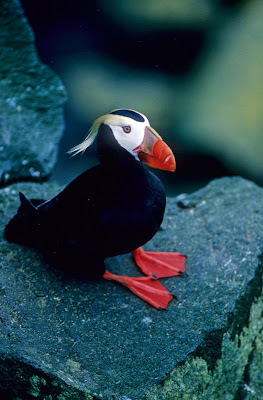 It is unofficially thought of as Bandon's official bird. A local lounge is even named after it. More than a dozen pairs regularly nested on the rock formation during the 1970s and '80s. It is believed that foxes may have been partly to blame for their absence in more recent years-along with changing climate conditions and additional city lights at night. Fish and Wildlife Service studies indicate Oregon's tufted puffin population has declined by about 75 percent over the past 20 years. Last season, about a dozen birds were spotted on the rocky formations on the Bandon coast, but it was not apparent if the those birds were nesting. Elephant Rock is part of the Oregon Islands National Wildlife Refuge. Cornell Lab of Ornithology's All About Birds' profile for Tufted Puffin appears here. Want a Bolsa Chica bird calendar? Is birding a team sport?